Discussion in 'Growing Marijuana Outdoors' started by smoka_lota_pota, Apr 26, 2006. <HR style="COLOR: #ecfcb2" SIZE=1> one day i was chilling in my backyard and i noticed a small plant in my dirt. i looked closely and i noticed it was a marijuana plant. "dont ask me how it got there, i just dont know" but i desided to grow it. i put it in a small pot and water it every other day.should i water it more. i dont have any grow lamps or anything (im too damn broke) so i kepted it outside. so far its grown some 4-5 inches. i was wondering if one of you out there would help me out with this. ill take any advice anyone gives me. show me a picture and we'll go from there. 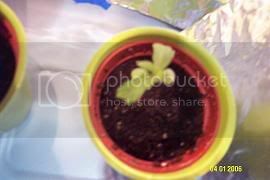 Ya unless yuo planted it there I highly doubt what you have is a marijuana plant can you get a picture? its real weed i get some pics soon. but ive seen it before, trusted me, pot head since 95'. My First Grow, Outdoors, PLEASE HELP! Noobie's first time grow, help (outdoors).